Stained glass has been popular for centuries. If you read our blog series on the history of stained glass, you’ll know that artists used it as a way to bring light into a space while also adding brilliant pools of color to the interior. Stained glass is an iconic part of some buildings, so much so that it is the defining feature! In today’s blog post, Entry Brite in Phoenix will discuss some of these famous examples of stained glass. We briefly mentioned this work of stained glass in a recent blog. For those who missed it, the stained glass at Augsburg Cathedral in Germany dates back to the 11th century, making it the oldest installation of stained glass still in situ. This multi-part art piece depicts Moses, Daniel, and other Christian figures. They are placed high in the walls of the church, allowing light to flood through them and for them to gaze down upon churchgoers. 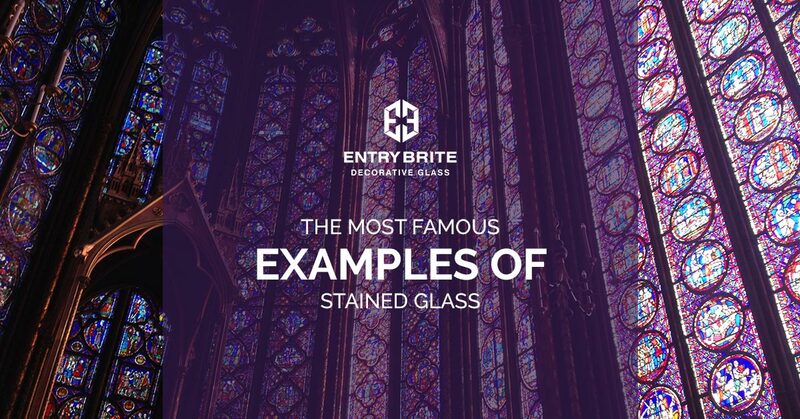 Each piece is typical of the early Gothic style, with lots of lead work separating hundreds of individual panes of glass, and with fine details, like faces, painted onto the glass itself. Originally constructed nearly 1,000 years ago, the Grossmünster Cathedral in Zürich had much of its original ornamentation stripped away during the Reformation. For several hundred years, only a few stained glass pieces stayed in the cathedral. In 2006, Sigmar Polke was approached to make new windows for the space. Rather than try and repeat and replicate the five remaining original stained glass windows that depicted religious icons, Polke took a much different path. The windows are made from hundreds of thin slices of agate. The result is an unusual but visually stunning window that creates beautiful patterns of color when light shines through them. Frank Lloyd Wright is known for his avant-garde home designs and his love for the arts and crafts style. In addition to his architectural work, Wright also experimented with stained glass. The medium had made a comeback during the Art Deco movement of the early 1900s, and Wright’s works accented his prairie style homes in ways that plain glass windows and accents simply could not. Much of Wright’s stained glass work uses bold colors, and series of circles, squares, and rectangles to create mesmerizing patterns that play with the light. The Second World War had a devastating impact on the ancient architecture of much of Europe. During the Coventry Blitz, the original Coventry Cathedral was bombed into ruin by the German Luftwaffe. The Cathedral was redesigned and rebuilt in the 1960s. As part of this new building, a massive stained glass wall was installed, allowing beautiful colored light to spill into the interior of the Cathedral. Stained glass is elegant and beautiful, brightening any home or living space. 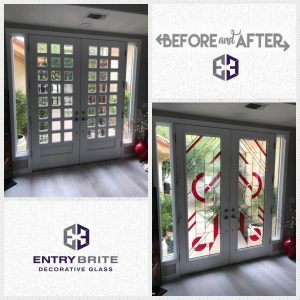 At Entry Brite, we want to help beautify your home in Phoenix with our amazing stained glass front doors. You can view our gallery to see our previous work, and then contact us today to start remodeling your entryway.